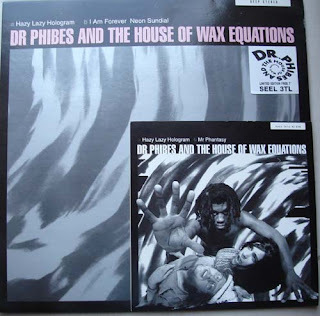 Likened by many to Jimi Hendrix's band because, well, because their guitarist was a black chap with dreadlocks, Dr Phibes and the House of Wax Equations were an "an underground indie psychedelic rock band based in the north west of England in the early to mid 1990s" (thank you once more myspace. From humble beginnings - meeting on a music course at South Cheshire College of Further Education - and taking their name from a Hammer Horror film, the band experienced moderate early 90s success: releasing a couple of albums, a handful of EPs, playing at Glastonbury in 1992 and recording a Peel Session and very possibly a session for Mark Radcliffe. Unfortunately, once more there doesn't seem to be a lot around to remember the band by, although they do seem to have inspired something of a cult following, leading to a sketchy wikipedia page and a few internet-recorded memories of people, like me, who can say "I saw the band play at [pub] in [town], [supporting/being supported by] [other band] and they were [brief critique]; where mine is "The Wharf", "Huddersfield", "being supported by", "a local band called, if I remember correctly, The Walking Seeds" and "pretty good if you like that sort of thing, but we were only there because they'd serve 16 year olds and there was an indie disco after". Rummaging around ebay and the like seems to turn up the possibility that there was a 12" version of the 1991 Hazy Lazy hologram EP - of which an mp3 to follow - that included a free copy of the 7" version. This is the lead track from the EP: Dr Phibes etc etc - Hazy Lazy Hologram. This is the radio edit version of the free insert 7" single as, to be honest, the 12" version is rather long and you'll hear everything you need to in this version. A brief yet invogorating diversion here from vague recollection to absolute obscurity. Ladies and gentleman, I give you The Sugars Rays. Who the hell they were is something I think i'll never know, but they certainly infringe on 'indie pop' by the sounds of the attached mp3. "The Sugar Rays are Nottingham's finest cartoon guitar band. With a garage load of energy they leap and bound the smallconfines of the stage like they actually enjoy the music. And so you can't help liking them because you know they couldn't give a flying one about the number of record companies present. This attitude shows through the music which hooks and winds its way around the three minute song with nonchalant affection and grinning humanity." And that's it, the one mention on the internet I can find is here: that seems to suggest this flexi is the only thing they ever created. It seems like a bit of a shame, I've certainly heard an awful lot worse music scraping into the charts, and I'm pretty sure it holds up against some of the other stuff on here fairly well. 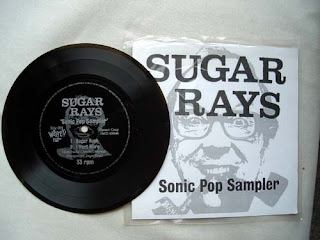 So here it is Sugar Rays - Sugar Rush. Surely this can't be the only living memory of the band? Shame. The Sugar Rays, we salute you (and then leave you in the box marked "HX2"). Hang on, it just occurred to me! ebay! Home of all the world's jumble! And there it is £2.99 ONO to you sir! How did we manage before the internet was invented? Before everyday people recorded everything they ever knew on web pages, I'd have been left with a vague recollection of a Huddersfield-based band called The Headmen who I saw play a few gigs at places like the Top Spot Snooker Club when I was a lad - presumably where I picked up the 7" plastic here - but really nothing more. "were signed to a local label (Positive Records) and released a demo tape ("The Happy Shoebox"), a single ("Kissed to Pieces") which got quite a bit of Radio 1 airplay, and a 12" EP ("Reach the Sky") — the demo tape was supposed to named "The Magic Shoebox", which was the name of a shoe shop opposite the "4th Wave Records" shop in Huddersfield." There is also a flickr group of photos from their gigs here. I've been looking through the photos for the past half hour and mercifully they're all from Halifax and Hipperholme gigs so I'm not in any of them. So actually I feel a bit dirty posting an mp3 of the music; so dirty I'm going to email Dave and ask him if it's ok. 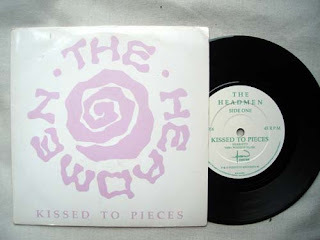 But because you've probably not heard of them and they are as deserving of going on here as any one else, catch while you can, The Headmen - Kissed to Pieces. 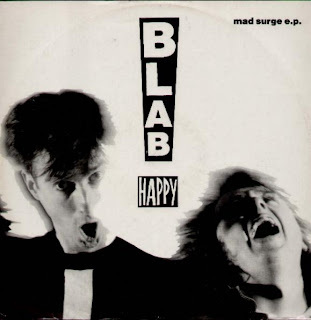 So, who the hell were Blab Happy? I really don't remember buying this EP - Mad Surge, from 1991 - and only stumbled across it while looking for something else. But it's a lovely, sign of the times piece of early 90s indie twiddlery, and that's what I'm here for. "Leicester's Blab Happy are a raw, rockin' cross between the Beatles harmonies of, say, The La's (only a little less retro) and the fuzzy guitars of That Petrol Emotion." This of course means what we expect by now, they sound a bit like Teenage Fanclub. Googling around I find two useful pieces of information about the band. Firstly, this bit of vinyl is worth 9 US Dollars to the good burghers of ebay and secondly, according to this 2003 article in the Guardian, the band had supported such noteables as Radiohead and Kingmaker. Yes, Kingmaker. So, long-forgotten, but briefly famous Blab Happy, we salute you; and here is Blab Happy - Never No More in all its crackly vinyl glory. I guess this blog thing is called what it is because Midway Still are up there with the greatest of the early 90s indie pop bands. More directly it's called what it is because I was in the pub with my mate Rich and he made some lucid and forceful point about early 90s indie pop bands by tapping his finger rather too hard on the table and making his conclusion by saying "you've got to remember this stuff, because Midway Still aren't coming back! "; or words to that effect. Anyway, Midway Still, as it turns out, capture everything that was good about indie in 1992. The music is jaunty and happy, the words are apparently carefree but turn out to be well written when listened to. And most of all, they sound like Teenage Fanclub who in turn, of course, are just a Big Star covers band. Taking their muse from Husker Du, Midway Still have described their music as being just the noise and tunes of a punk rock band into The Byrds and The Beatles. Yet their power-chord melodies catch classic strains of The Who and the Jam and in another era, they would have made a great mod band. So even the band and their label admit it. Sort of. (The wonders of Fire Records is another project all in itself of course). But the point for me is, sort of, that they epitomise the 90s music that I loved and want to remember here; listen, if you will, to this offering ("Midway Still - Better Than Before") a couple of times and tell me you're not singing along and tapping your feet, yearning for those happy days of snakebite and cheap roll-ups at the student disco. 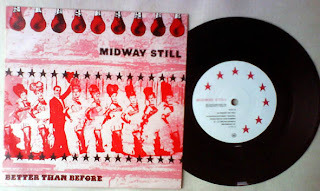 As a footnote: Midway Still did of course make a brief comeback last year in London to celebrate the life of the late Darren 'Wiz' Brown, erstwile Mega City Four singer/guitarist. That's right, it's flexi-disk time once again! This one courtesy of Irish indie funsters A House. formed in the mid-80s, once more this is a tale of not living up to potential; the band never hit the big time as was hoped, with "Endless Art" - an indie disco favourite nonetheless - the only release to even think about possibly trouble the chart compilers. The flexi pictured and featured was apparently sent to their fan club members in the Christmas of 1992. I don't remember being a member of the fan club, but there's the flexi with my name and address on, so I must have been. Drinking in Manchester in the early 1990s was a dangerous thing for the impressionable and gullible music fan like myself. More jingly-jangly 1991 indie pop piffle today with Oxford's Five Thirty. Those of you keeping track will note the similarities between this band and those other monsters of shoe-gazing Ride - it was all floppy hair and wailing guitars round Oxfordshire in those days. And boy did we love it. Not as popular as their local counterparts, Five Thirty relocated to London to try and make it in the big city. Unfortunately they failed to trouble the chart compilers in their brief existence (1985ish-1992), but they did produce some good old screaming and gnashing guitar music. It's suggested that they were years before their time and the band would have made more of an impact in the Britpop years, but we've seen it before; another band unfairly doomed to the obscurity of indiepop completist's record collections and fading memories of simpler times. 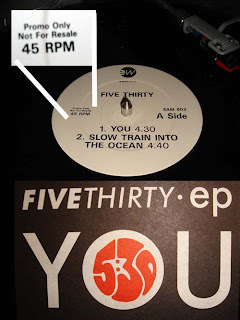 Once more this is from a promo bit of vinyl - funny how those are the ones that survive so well: Five Thirty - You.